Without dedication, certain things can't be done. If the application isn't dedicated, there are things that can't be done. Dedicated Video File Management Software. TMPGEnc KARMA.. Plus 2 is a dedicated application that can centrally manage browsing, searching, classification, comparison, and more of many movie files saved on your computer. Recently, recording or content formats are largely changing from pictures into movies because of the progression of technology such as the communications infrastructure or smart phones. Now, an over-abundance of video files can occupy a PC's hard drive, and a solution is needed to manage this continuously increasing amount of video files. That solution is TMPGEnc KARMA.. Plus 2. In this new version, most of the interfaces have been improved based on the feedback from the previous version's users, and provides a multitude of new and improved functions such as digest movie playback via a simple mouseover, adding chapters using commercial candidates detection, double speed playback with audio, and more. In addition, this version supports H.264/AVC and H.265/HEVC hardware encoding by using Intel™ Quick Sync Video, NVIDIA NVENC and AMD Media SDK(VCE) technologies. "Linking with TMPGEnc products", "Karma Level" and other brand-new functions help refine this version to be more convenient and enjoyable. Achieves blazing fast video file management by simple structures. Just drag 'n drop to simply and rapidly categorize your files. In TMPGEnc KARMA.. Plus 2, your video files can be managed by adding categories. Since the registered files (clips) in TMPGEnc KARMA.. Plus 2 are listed and displayed, you can finish the classification just by dragging files into the category panel where you want. So you won't need to add tags or drag into a tiny space, you can just drag clips from the top to the bottom or the bottom to the top. You can freely specify the categories which display in the library panels located at the top and bottom, so it is possible to display the same category with different sorting in both library panels. This application does not move or copy the actual files, which allows you to classify your own files very rapidly. Besides registering files or folders manually, TMPGEnc KARMA.. Plus 2 allows you to register arbitrary folders as managed folders. Since newly added files into the managed folders are registered automatically to the library upon library update, you can keep the library at its latest state. Supports the latest and a wide variety of Input Formats. TMPGEnc KARMA.. Plus 2 natively supports a wide variety of time-tested and recent formats from MPEG-1/2, H.264/AVC, AVI, WMV, MOV to WebM and Ogg, etc. You practically don't even need to install external CODECs; you can handle or playback without needing any knowledge of these formats. Furthermore, you can select a specific import title clip within a TS or MXF file, and by using the thumbnail preview, you can verify the content beforehand and avoid any mistakes. "2" supports the following new formats and functions. Now supports importing the "H.265/HEVC" format which is the successor to H.264/AVC and is the latest video compression standard. You can directly import and playback the format which the adoption will be expanding in the future. Now supports importing MXF containers, which are mainly used in the professional market. 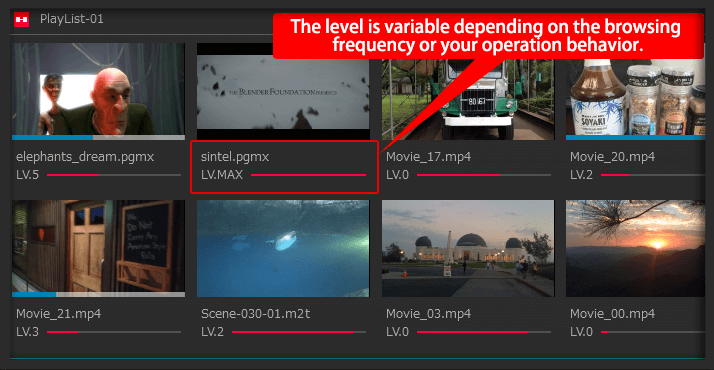 TMPGEnc KARMA.. Plus 2 can also analyze and let you choose a multi-structured video file. Thus, you can import video and audio streams incorporated with an MXF container without any difficulties. 10-bit 4:4:4 H.264/AVC Input Support. TMPGEnc KARMA.. Plus 2 is capable of importing the H.264/AVC High Intra 4:4:4 profile. 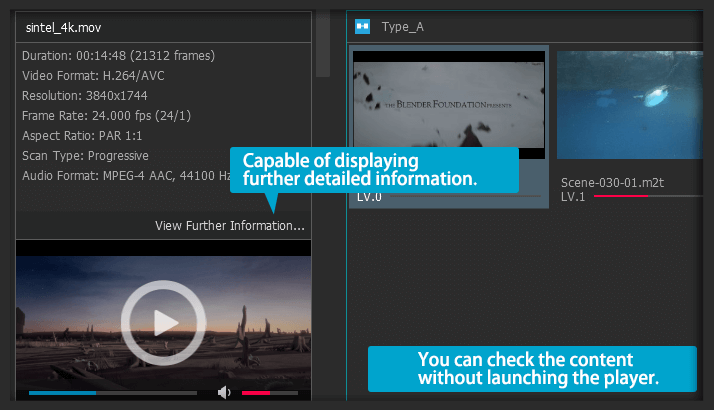 You can playback the high profile H.264/AVC files natively in the internal player. 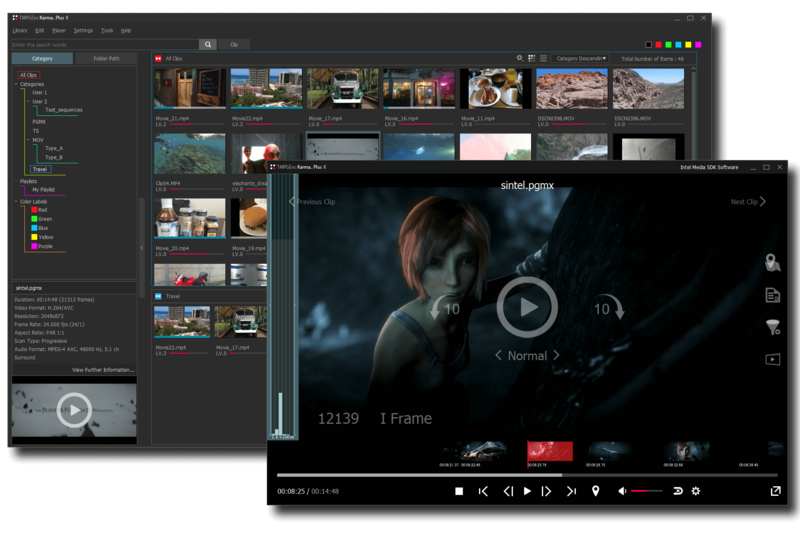 Supports importing and directly editing using the high quality video 4K/HD video format "XAVC S" which is advocated by Sony. You can directly import and watch a XAVC S camera recording high quality movie. 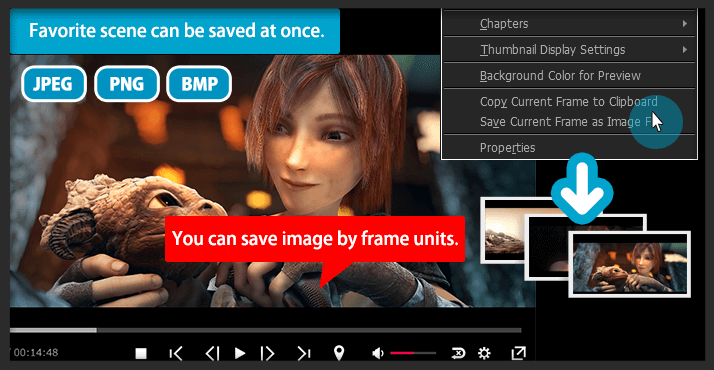 Supports WebM and Ogg (Video: Theora Audio: Vorbis) input. Both are open source video formats and focus on high quality video with low file sizes, and are mainly used for playing on Android devices (WebM) and Web browsers. TMPGEnc KARMA.. Plus 2 further supports importing VP9 WebM file. This version is capable of importing and playing a simple audio file such as a FLAC, MP3 or AAC file. Of course, an embedded picture in the audio file is also displayed in the player if it exists. 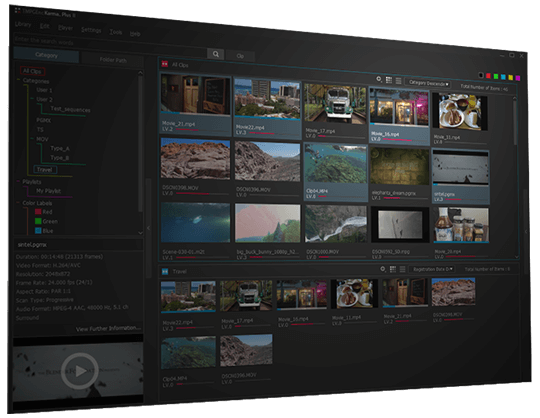 A MPEG-2 TS, MXF file or PGMX file sometimes contains a multi-structured video file (containing several video and audio streams) or video where there are resolution changes mid-flow. TMPGEnc KARMA.. Plus 2 allows you to analyze such files anytime and choose an arbitrary title displayed by the analyzer. * Encrypted or copy-protected files cannot be imported. Native Support for 64-bit Architecture. This version is designed only for 64-bit architecture environments. Along with this enhancement, the application is capable of using an outstandingly large memory size. Therefore, operations become much easier and smoother when handling a lot of clips. *This application does not support 32-bit OS environments. TMPGEnc KARMA.. Plus 2 has been improved for realizing more comfortable management operations based on the feedback from the previous version. 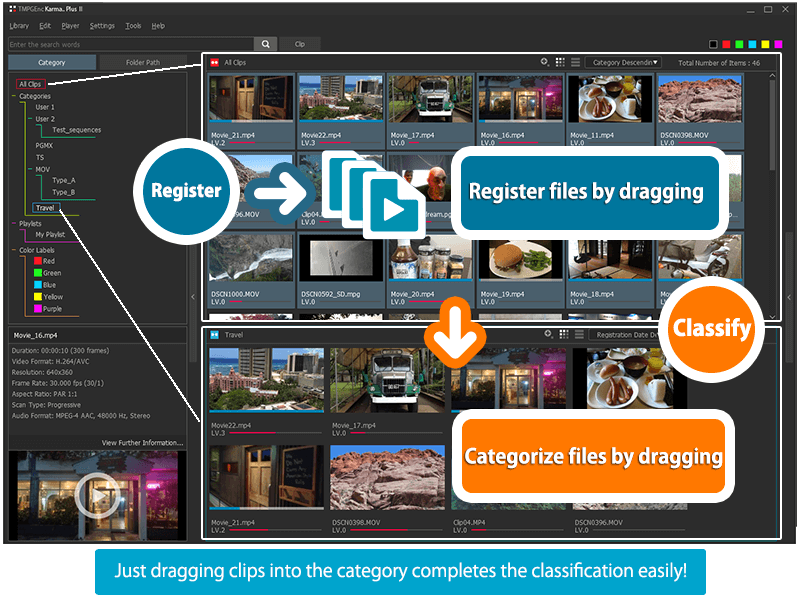 This new software maintains the concept of reducing complex interface structures or functions as much as possible, while allowing for detailed attention which lets you handle and view clips in the library without stress. 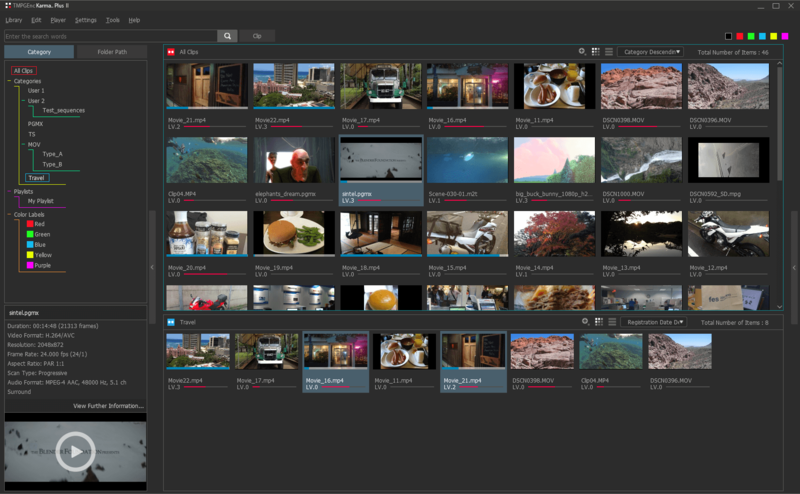 Each of the library panels in TMPGEnc KARMA.. Plus 2 allows you to set the view type, thumbnail view or list view, including the thumbnail size or the sorting type, independently of each other. Since it can be operated by a mouse but also by a keyboard, you can switch quickly to the display which you want to adapt with the situation. Just by hovering the mouse cursor on the thumbnail displayed in the library view, you can see a summary of the content immediately. In addition to the existing Flip Display, in this version the Movie Display mode has been added which is able to playback the digest movie of the content. It is also possible to playback the audio of the digest movie. 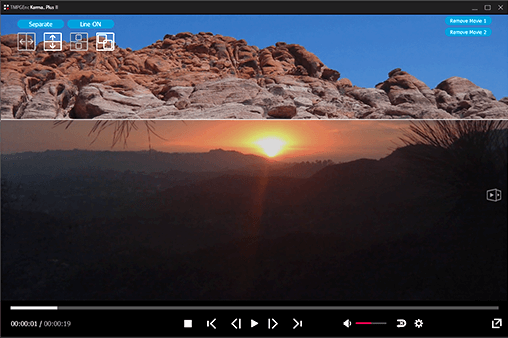 Since the blue-colored indicator is displayed on clips that are already viewed or in the middle of viewing, it is not necessary to memorize the clip or position which you have already viewed. The last viewed position of the clip which is in the middle of viewing will be restored when you play it, of course. * This function cannot be used when the resume option is not enabled. 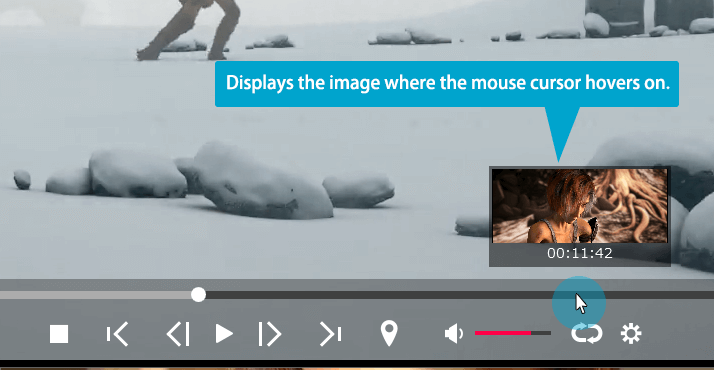 The library view implements the "Quick Preview" function, which allows you to verify the video and audio overview of a selected clip without launching the player window. It is capable of relocating the thumbnail position to where you want, and allows you to confirm the aspect ratio and the audio channel mode. Features the Commercial Candidates Detector. TMPGEnc KARMA.. Plus 2 features the "Commercial Candidates Detection" function which analyzes several elements in a clip such as audio and scene change positions, and then detects the most likely candidate positions of commercials. The detected candidate positions are registered as chapters and can be used in the player to skip or search scenes quickly. By using the same file name of a keyframe file (.keyframe) which is exported from the Pegasys product with that of the source file in the same folder, the keyframes will be reflected automatically as chapters when reading the source file as a clip. In the environment where a supported product is already installed, you can directly open the clip with the editing window of the TMPGEnc product through the right-click menu of the clip in the library window. 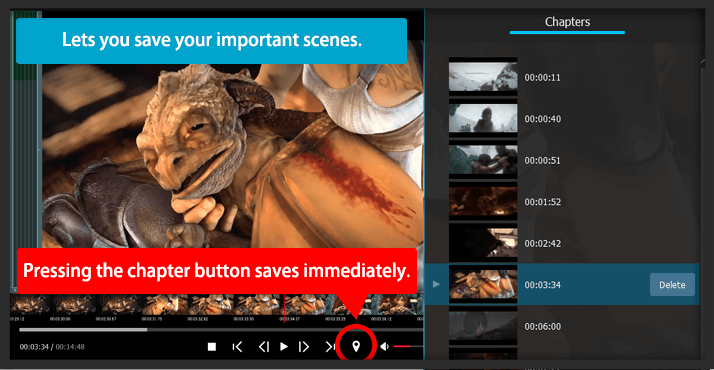 You can edit the clip immediately without wasting your time because it is not necessary to launch the main application and then import the clip. It is also possible to open the registered clip with arbitrary software. 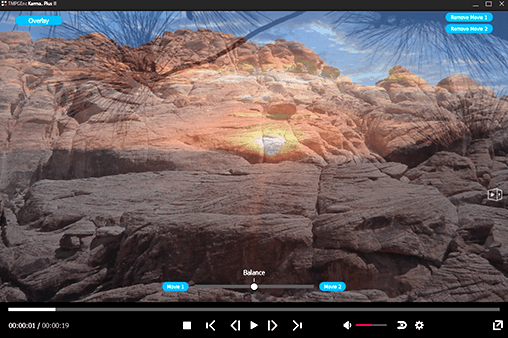 Not just video players, it is capable of linking with an editing application such as Windows Movie Maker. * Same operation as the "Open with" option of Windows Explorer. In the "Playlist" category, you can set and arrange the order of several different or identical clips without concerning the sort order. Great for videos that are meant to be played in sequence or for creating your own video marathon. If you want to place a reminder for when later playback or mark instantly without a new categorization, the Color Label function is a very convenient tool. 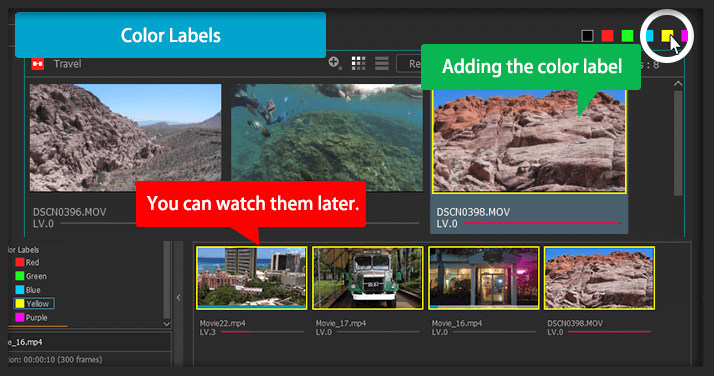 Just add a color label to the clip by clicking, and you can display the same color label clips on one display section. The color can be changed to any color you like. The player within TMPGEnc KARMA.. Plus 2 has been completely renewed. 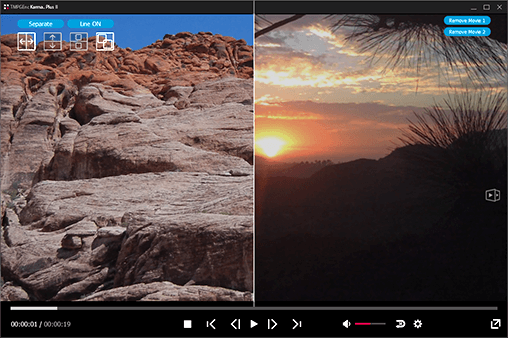 Not only is it video management software, this version also focuses on improving functions for viewing without any hassle, and includes lots of functions based on the feedback we received. Don't worry, it also supports 8K resolution video playback, so please enjoy your video life with this more free and comfortable player. You can search any scene quickly simply by clicking the right mouse button while viewing the quick-scrolling thumbnail strip. 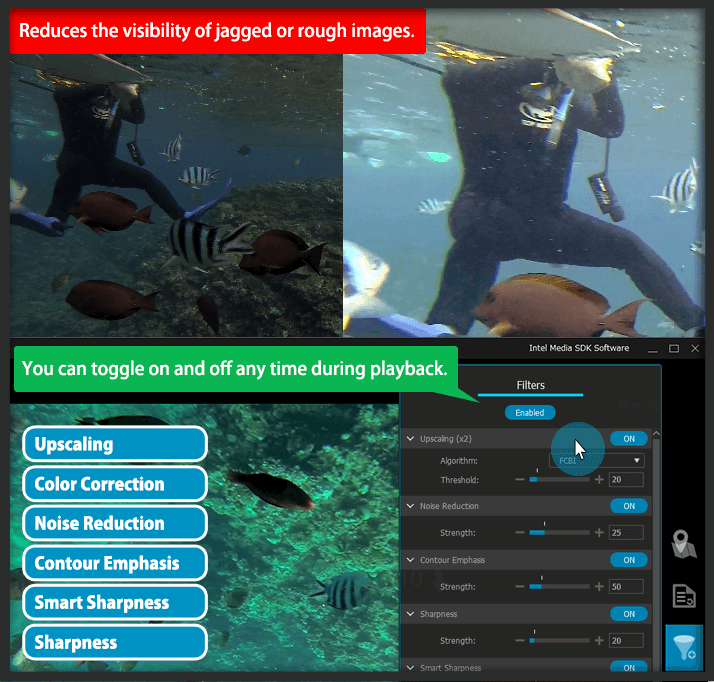 Clicking on the middle mouse button activates Smart Scene Search, which automatically moves the playhead to the closest scene change. * You can enable or disable at anytime. Just hovering on the seek bar at any place with the mouse cursor displays the thumbnail of the content at that point, which allows you to look for a scene in advance without any clicking. By using this function, you can find and seek the place where you want easily without clicking many times to find the scene you're looking for. In addition to the standard fast forward/backward, you can watch movies at a higher speed up to 2.0x without affecting the audio quality. 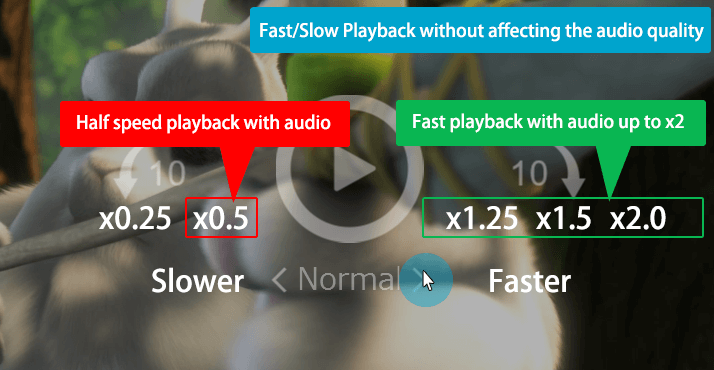 Since the pitch of the audio is kept no matter the speed setting, you can watch the movie within a shorter time while understanding the content. Also the player supports 0.25x and 0.5x slow playback. * The audio is not played during the 0.25x slow playback. * The standard fast forward/backward is up to x8 speed. Flexible Preview Control Focused on the 8K Era. The Preview panel of TMPGEnc KARMA.. Plus 2 allows you to zoom-in, zoom-out and even drag and reposition the preview image to your liking freely. 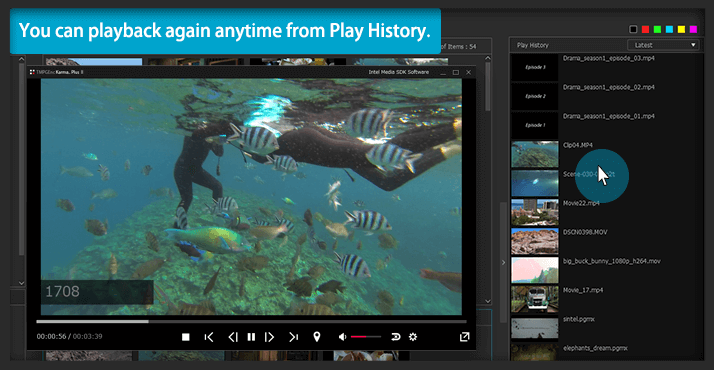 This allows you to examine fine details in your video in real-time while playing. "AMD Media SDK" Hardware Decoding Support. 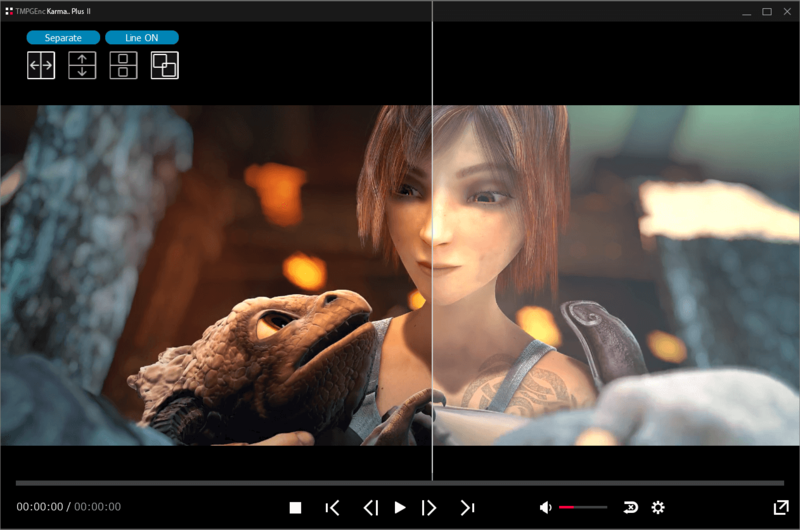 NVIDIA® NVDEC technology, the Intel® Media SDK(Quick Sync Video) and AMD Media SDK are supported for hardware video decoding. In a compatible environment, TMPGEnc KARMA.. Plus 2 supports MPEG-2, H.265/HEVC and other format hardware decoding of those functions. In a NVIDIA graphics card environment, CUDA technology can be used for filter processing. CUDA technology uses the GPU's (graphics card CPU) multiple core parallel processing to solve complex problems in a short amount of time. By splitting many processes into multiple elements and parallelizing them, and using the GPU's massive processing power, programs can run more efficiently. * Acceleration cannot be guaranteed in all environments. * Requires a compatible environment. Displays Current Frame Information in Real-time. It is possible to display the current frame number and time in the preview area. 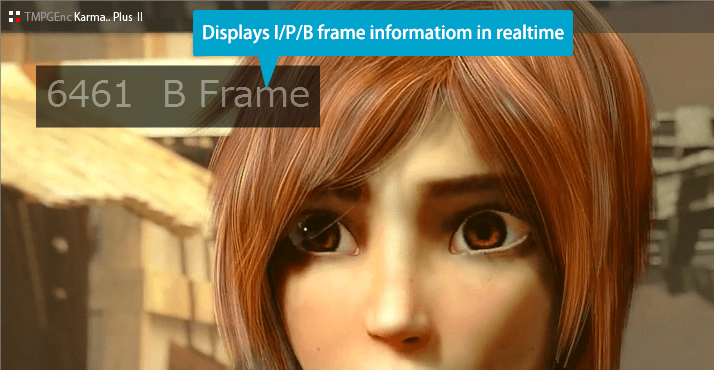 The current frame picture type information (I / P / B frame) is also displayed in real-time*1, which is useful to verify or analyze frames of the video. *1 Displays only in the MPEG reader. * Enable and disable at anytime. If you stop the playback for whatever reason, you can resume playback from where you left off with the playback resume function. Accidentaly closed the player? No worries, it'll keep track of where you left off so you can get back to viewing your video quickly. Multiple Subtitles and Audio Playback/Selection Support. TMPGEnc KARMA.. Plus 2's player normally supports displaying the subtitles which is stored in a MPEG-TS, MKV and other files. In addition to the stored subtitles, it is also possible to display subtitles from a file which you specify directly*1. Also, when the stored subtitles are in "Text subtitles" format, you can switch between your preferred settings for the font size, color, border, and more. 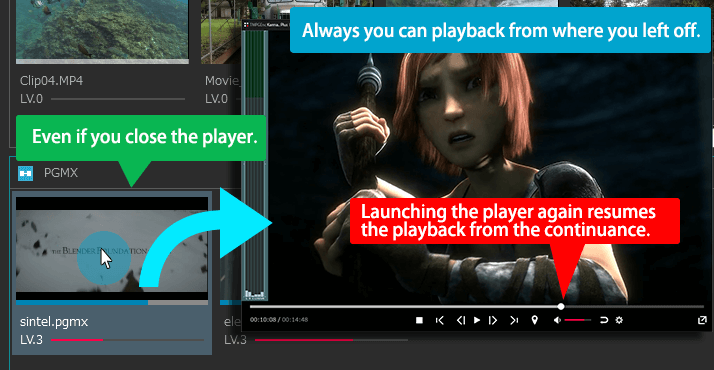 You can switch subtitles or audio in the player at any time even if the multiple subtitle or audio stored. 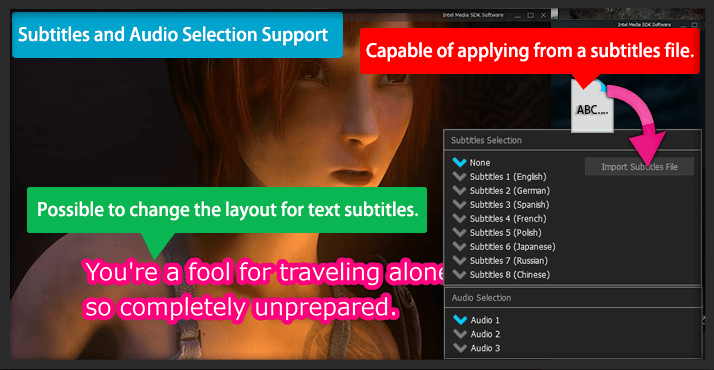 *1 Supports SRT subtitles, PGMX subtitles and xsubtitle format. * Blu-ray or AVCHD subtitles cannot be imported. Just clicking on the chapter button within the player adds a chapter point. Added chapters are displayed in the list, and you can start playback any time from an arbitrary chapter point. Also, when the chapters are stored in a MP4, MKV, WMV or PGMX file, the chapters are registered in the list automatically as chapter points when importing the file.. Rough, Dark. Make it More Easy to See. TMPGEnc KARMA.. Plus 2's player implements the "Double Upscaling" filter which is capable of upscaling the image up to 2 times, such as SD to HD size and applying the suitable interpolation with the algorithm even if the picture is rough, the "Contour Emphasis" filter which detects the edges and enhances the contours of the picture, or the "Color Correction" filter which can adjust a dark picture to be lighter. You can switch filters any time while playing of course. * The Double Upscaling filter is recommended for all videos with a resolution of 480 pixels in height or less. The filter can also be applied to larger videos but may not yield good results on high-resolution images, and can also slow down its playback. Allows you to save the currently displayed image on the player as an image file. TMPGEnc KARMA.. Plus 2's player is able to playback by frame units, so you never miss the scene where you want to save. Full Synchronous Playback of Two Video Files. TMPGEnc KARMA.. Plus 2’s player features the Dual Mode, which can playback two video files full synchronously. 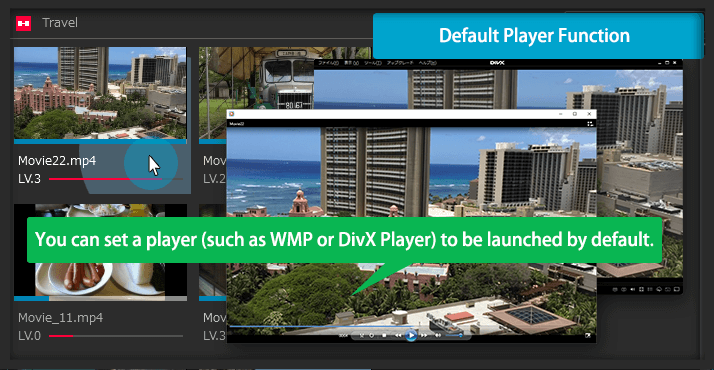 The dual mode player allows you to switch between "Overlay" mode and "Separate" mode. 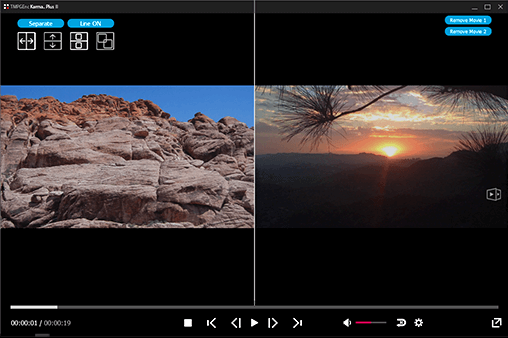 The"Overlay" mode where the videos are layered one on top of the other, and the "Separate" mode offers a split screen to the range or size of each video. 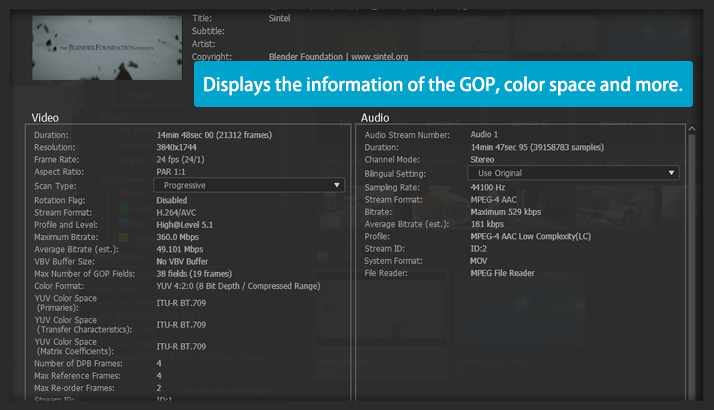 Thus this mode lets you perform various purposes to compare video files for the encoded picture quality, or verify the result of the color correction, etc. Intel®, NVIDIA and AMD, All Hardware Supported. TMPGEnc KARMA.. Plus 2 supports the high-speed encoder which utilizes the CPU or GPU provided by Intel, NVIDIA and AMD companies. H.264/AVC and H.265/HEVC are supported as the encoding file formats, and it is capable of exporting maximum 4K size resolution. In TMPGEnc KARMA.. Plus 2, you can use the high-speed and low CPU usage encoders in a simple and easy operation. * The output container is fixed as MP4. * No software encoding function is installed. * No cutting and editing functions are installed. 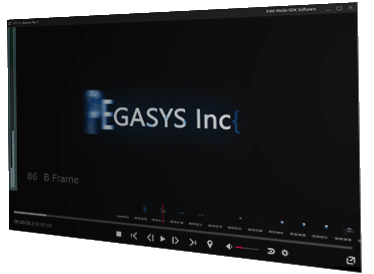 Supports the high-speed encoding function featured in Intel® Media Quick Sync Video in an Intel supported CPU environment. 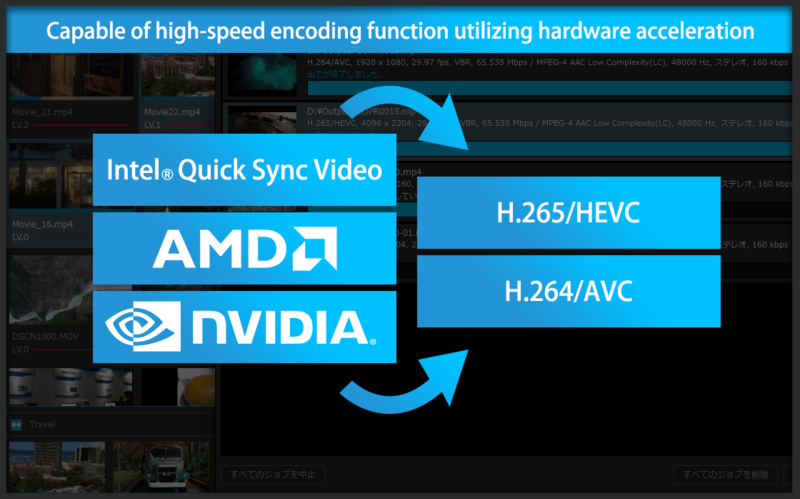 H.265/HEVC encoding is also supported, in addition to H.264/AVC encoding. High-Speed Hardware Encoder "NVENC" Support. Allows you to use NVIDIA's "NVENC" that is installed on a 600-series and later GPU (Kepler core generation) which supports H.264/AVC high-speed hardware encoding. Also, now supports H.265/HEVC encoding which is supported by the GeForce GTX970 (GM204 DAI) or later GPUs. * The CUDA encoder is not supported. 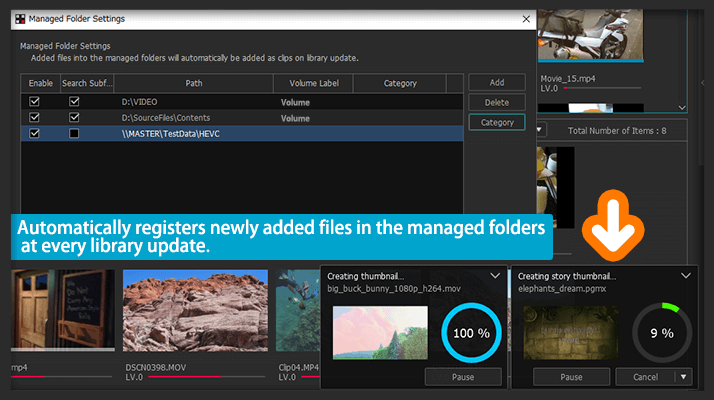 AMD Media SDK (VCE) High-Speed Encoder Support. In a supported Advanced Micro Devices' graphics card environment, you can utilize its H.264/AVC hardware encoder function (VCE). Also, now supports H.265/HEVC encoding which is supported by the RX400 (Polaris core) or later GPUs. Exports just by selecting from the right-click menu. To start the file export, you just click the clip then select the option from the right-click menu. Multiple clips are also selectable of course. 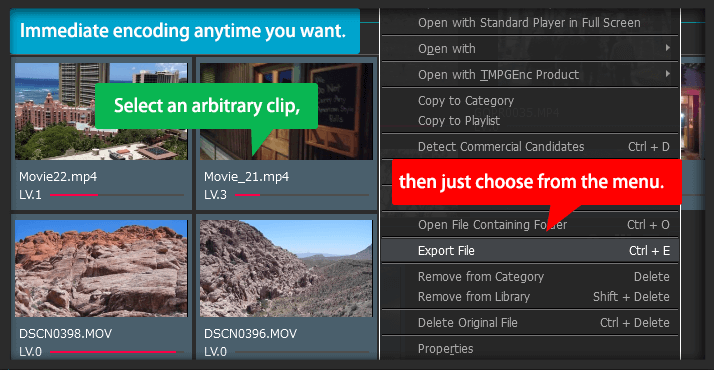 It is also possible to register the exported clip automatically into the category where you like. Exporting managed centrally by Export Manager. The file export jobs are batch processed by the Export Manager. You can control centrally the operations such as start or stop a job, or replacing the job order, etc. Besides the following functions, even more features have been implemented in TMPGEnc KARMA.. Plus 2. Try it for yourself! TMPGEnc Smart Tap Controller Support. 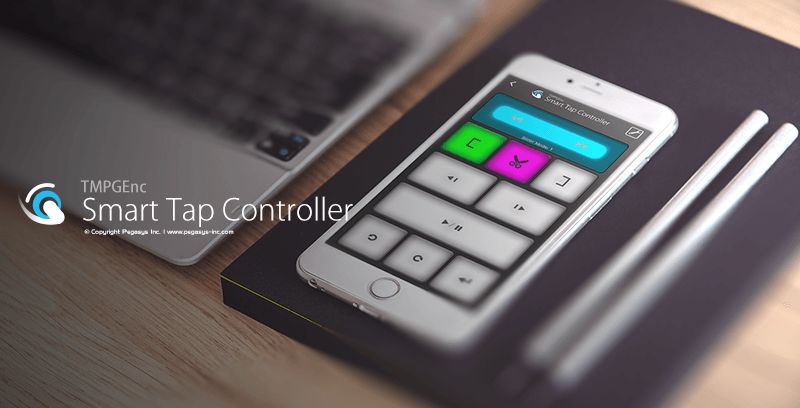 Supports "TMPGEnc Smart Tap Controller" which is an auxiliary controller that can control the player operations of TMPGEnc KARMA.. Plus 2 from your iPhone or iPad. In combination with a keyboard, a mouse or other peripherals, this controller allows more choices for user operation based on the user's preferences and makes editing smarter than ever. The Karma Level function, which received a favorable reception in the free version, has now been installed in TMPGEnc KARMA.. Plus 2. The Karma Level of each clip is varied in response to the view count, operations or other interactions. Your devotion to clips will be tested. TMPGEnc KARMA.. Plus 2 features the Playback History function into each window of the main interface and the player. You can playback the recently played clips again any time just by selecting it from the list. Capable of registering the Default Player. Normally TMPGEnc KARMA.. Plus 2 launches the installed standard player when selecting a clip when double-clicking or pressing the Enter Key. However, you can register an arbitrary player which you want to use instead of the standard player. With this function, you can save or recover your current library database and settings at any time. This is useful for backup purposes, or for switching between several databases depending on your situation. By placing an image with the same name as the source file in the same folder, the image file will be reflected automatically as the thumbnail of the clip. Use it as a cover or eye-catching image. Discover even more improved functions! Test out the software for yourself! The following functions which are included in TMPGEnc KARMA.. Plus cannot be used in TMPGEnc KARMA.. Plus 2. Please be aware of these changes before purchasing the TMPGEnc KARMA.. Plus 2 upgrade version. * Virtualized environments are not supported. Available hard disk space 300 MB for the application + more space for thumbnail files, etc. Requires the adopted resolution when the DPI settings of the Windows Display is other than 100%. * This software may not function properly in environments where the memory is less than 2 GB and shared with an integrated graphic processor. In such cases, a warning may display at launch. This software cannot be used with computers having less than 1.5 GB of available memory (ex: memory shared with the video processor). In this case, increasing the amount of memory may fix such issues. Refer to your computer's documentation and/or contact your computer vendor for more information regarding memory extension. ** A FAT32 formatted hard disk drive (HDD) does not support a file size higher than 4 GB. Preferably, output your file to an NTFS partition. If you are using a FAT32 formatted HDD or external disk, it may be possible to convert it into NTFS format. Refer to your device's user manual or contact the device maker. Intel Media SDK Hardware The MPEG-2 Decoding and the H.264/AVC Decoding/Encoding functions are available in the following supported environments. Requires an environment with an Intel compatible CPU (SandyBridge core or newer) and a compatible driver with Intel Quick Sync Video functions. When using the H.265/HEVC video decoder in the Stream Format, an environment with an Intel compatible CPU (Haswell core or newer) and a compatible driver with Intel Quick Sync Video functions are required. When using the H.265/HEVC video encoder in the Stream Format, an environment with an Intel compatible CPU (Skylake core or newer) and a compatible driver with Intel Quick Sync Video functions are required. * When using the Main 10 profile, a Kabylake core environment is required. NVIDIA CUDA(NVDEC) The filter computing support, and the MPEG-1/2 and H.264/AVC Decoding functions(NVDEC) are available in the following supported environments. Requires an environment with a 400-series and later GPU (Fermi core or later generations) and a compatible driver with CUDA. When using the H.265/HEVC video decoder in the Stream Format, an environment with a GeForce GTX 950 (GM206 DAI) or later GPU and a compatible driver with CUDA is required. Supported Driver Versions: Version. 353.90 or later. NVIDIA NVENC The H.264/AVC Encoding function is available in the following supported environments. Requires an environment with a 600-series or later GPU (Kepler core generation) and a compatible driver. *The 600/700 series includes specific models with the Fermi core that cannot be used. When using the H.265/HEVC video encoder in the Stream Format, an environment with a GeForce GTX 970 (GM204 DAI) or later GPU and a compatible driver is required. * When using the Main 10 profile, a 1000-series or later GPU (Pascal core generation) is required. AMD Media SDK The H.264/AVC Decoding/Encoding functions are available in the following supported environments. A compatible driver is also required. When using the H.265/HEVC video encoder in the Stream Format, an environment with a RX400-series and later GPU (Polaris generations) and a compatible driver is required. When using the H.264/AVC video encoder, using the B frame option cannot be used with anything other than a "Tonga" core graphics card. When using the H.265/HEVC video encoder, the B frame option cannot be used. TMPGEnc, PGMX, and the TE symbol are registered trademarks of Pegasys Inc.
Microsoft, Windows, DirectShow, and DirectX are registered trademarks of Microsoft Corporation for the United States of America and other countries. Windows Media is a trademark of Microsoft Corporation for the United States of America and other countries. QuickTime is a registered trademark of Apple Inc. for the United States of America and other countries. CRIWARE is a registered trademark of CRI Middleware for Japan and other countries. DivX®, DivX Certified® and associated logos are trademarks of DivX, LLC and are used under license. xbyak - Copyright© 2007 MITSUNARI Shigeo. All rights reserved. WebM - Copyright© 2010, Google Inc. All rights reserved. Mersenne Twister - Copyright© 1997 - 2002, Makoto Matsumoto and Takuji Nishimura, All rights reserved. All other marks, product names and company names are the property of their respective owners. Product specifications may change without prior notice.